Lucie (Chloé Coullaud) is on her first day as an in-home caregiver in a gloomy seaside town in Brittany, assigned to the estate of a Mrs Jessel. Mrs. Jessel lies in a cerebral coma, by herself, in her large desolate house. Lucie learns from her trainer that Mrs. Jessel, once a dance instructor who lost her only daughter years, has hidden a treasure in her home that she's holding onto as part of her final will. Upon retelling this story to her boyfriend, William (Félix Moati), the two along with William's brother, Ben (Jérémy Kapone), decide to go to the woman's home late on Halloween night and find the treasure for themselves. As the house reveals itself to be increasingly peculiar, their hunt for the Jessel treasure leads them into ahorrifying supernatural series of events that will change Lucie's life forever. Screened to some acclaim at festivals, including Frightfest's Halloween all-nighter, Livid is a visually stylish slice of gothic horror from Julien Maury and Alexandre Bustillo, whose previous film was the highly praised horror Inside. It's fair to say that Livid has not attracted quite the level of acclaim as its violent predecessor, but Film Threat described it as "easily one of the most beautifully shot films I had the pleasure of seeing," while Twitch felt it confirmed that "Maury and Bustillo are still among the most inventive and talented directors in the international horror scene today." 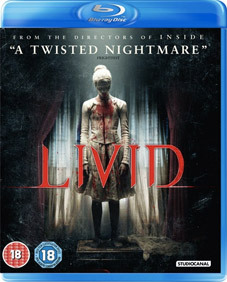 Livid (Livide) will be released on UK DVD and Blu-ray on 13th August 2012 by StudioCanal at the RRP of £15.99 for the DVD and £19.99 for the Blu-ray. Interviews with Julien Maury & Alexandre, Marie-Claude Pietragalia, Catherine Jacob, Félix Moati & Jérémy Kapone.